Two whole sea bass cleaned and patted dry from any excess moisture. Salt and pepper the Sea Bass generously inside and out. Put it in a shallow plate. Put the cubed potatoes and slice onions in a shallow plate as well. Season lightly with salt and pepper and set aside. Mix all of the marinade ingredients together. Coat the fish generously inside and out with half of the marinade. Cover with plastic wrap. Pour the remaining marinade over the vegetables. Coat well and cover with plastic wrap too. Refrigerate the fish and vegetables and marinate for at least four hours. Preheat the oven at 400F. Lightly oil a large ovenproof skillet and put the fish, along with the marinade, in the middle. 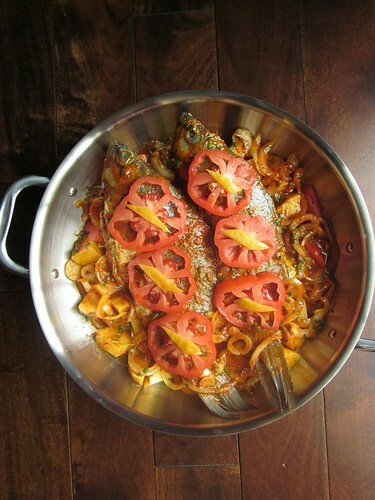 Decorate the top of the fish with slices of tomato and thin sliced of preserved lemon, if using, or fresh vegetables. Arrange the vegetables along with the marinade around the fish. Cover the skillet with foil and bake for 1 hour. Serve with plenty of bread to mop up the delicious caramelized sauce and slices of fresh lemons to press over the fish.